I love amber perfumes. I love their warmth, their other-worldliness and their ability to envelope. Ambra Nera is no exception. Upon application, this opens with a strong pop of cypress and eucalyptus and a slight sweetness. From the start, this is a scent that says, “here I am.” After a little while the vanilla comes out along with a light powdery finish. This is an elegant amber that transports your back in time to the Italian Renaissance. I have to say that my husband said that it makes me smell like someone’s grandmother. That comment had me worried that the scent was too feminine. I realize that everybody has their opinion, but from my end, I absolutely love this scent and the way it made me feel and how it wore on me. This is a unisex scent that has a light sweetness about it that could lean a bit feminine, but if you’re not afraid of unisex scents and embracing your feminine side, I highly recommend this perfume because it is truly a beautiful composition. Categories: Farmacia SS. Annunziata dal 1561 | Tags: 5 bones, amber, Ambra Nera, cypress, eucalyptus, Farmacia SS. 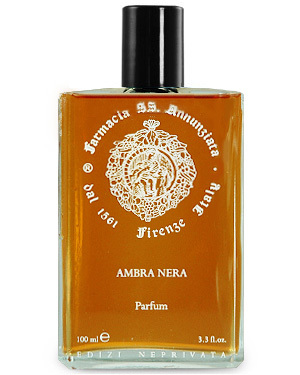 Annunziata dal 1561, moderately expensive, parfum, review, unisex, vanilla, warm | Permalink.